With more than 1,000 acres (405 hectares) protected, the Pugwash Estuary is one of the Nature Conservancy of Canada's largest conservation areas in Nova Scotia. Pugwash is a mix of undeveloped forest, marsh and coastline that borders some of the most sought-after oceanfront property in Nova Scotia. It provides habitat for many species of migratory birds and waterfowl, such as Canada goose and green-winged teal. It also features a well-maintained trail, a popular destination for birders and hikers. Pugwash is truly a spectacular and valuable conservation area. Features diverse habitats, ranging from nutrient-rich salt marshes to sandy beaches that encircle some of the warmest waters north of the Carolinas. The area is home to Barrow's goldeneye, a species at risk. The region is a prime staging and migration route for an incredible variety of waterfowl, including American black duck, Canada goose, great blue heron and green-winged teal. The estuary is a blend of forests, salt marshes, beaches and islands. Twenty-seven species of shorebirds, including semipalmated sandpiper and willet, pass through the region during spring and fall migrations. The Northumberland Strait is a prime area for coastal development. The Pugwash region is commonly referred to as cottage country, as it boasts warm ocean water and many of the most spectacular beaches in Nova Scotia. 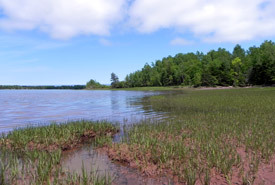 The delicate Pugwash Estuary ecosystem remains largely untouched. It is home to a wide variety of sensitive waterfowl and many special natural features. If development continues unchecked, the region's unique plants and animals could be jeopardized. Thanks to our donors and partners, the Nature Conservancy of Canada (NCC) has built a large conservation area around the Pugwash Estuary that protects important coastal forest and wetland habitat. By creating a buffer between coastal development and the forests, marshes and beaches inhabited by many species of waterfowl, NCC is conserving the unique and balanced ecosystem of the Pugwash Estuary. By securing additional land, continuing our stewardship with tremendous volunteers and maintaining strong partnerships with local organizations, NCC will actively protect this beautiful piece of Atlantic Canada.